This article was originally published in the December 2017 issue of Lawn and Landscape. 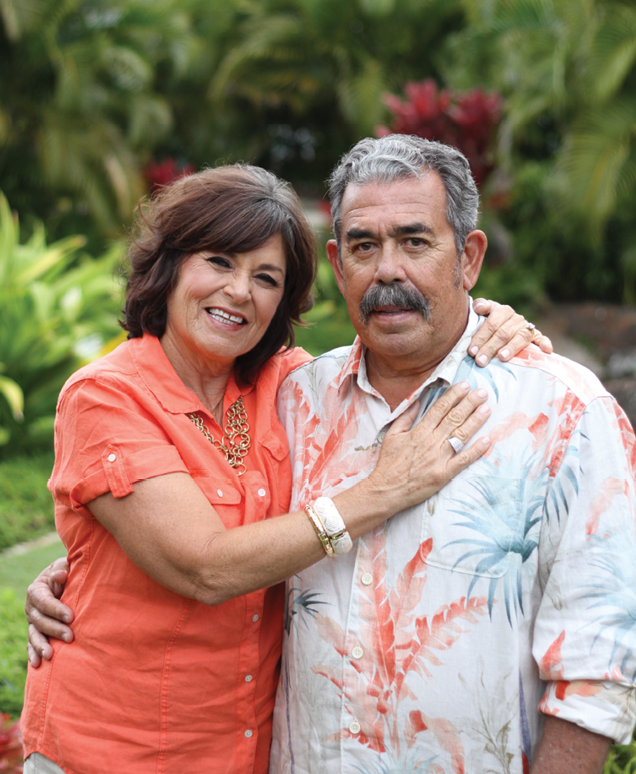 Two hurricanes a decade apart could have forced Frank and Abby Santos to close shop. Instead, they used the experiences from the storms to not only survive, but grow their business. When a second hurricane hit Abigail Santos’ landscaping business, she was ready to close shop and move on to something else. She could go back to nursing, or work a 9-5 service job. Anything other than having to pick up the pieces again from a devastating natural disaster. Her husband Frank, who was also her business partner, had other plans. The pep talk was all she needed, and 25 years later, No Ka Oi, (which means “the best” in Hawaiian), is a thriving $5-million business with 70 employees. It was only because of a spontaneous decision that she ended up in Hawaii, or in the green industry at all. Santos grew up on the East Coast and attended the University of Maryland, where she studied secondary English education in a program that offered free tuition to students who taught in the state after graduation. During her senior year, they told her there were no teaching positions available, forcing her out of the program. Her family had just moved to California, so she headed west seeking new opportunity. Some friends stopped by on their way to Hawaii, and Santos made a spur-of-the-moment decision to join them. 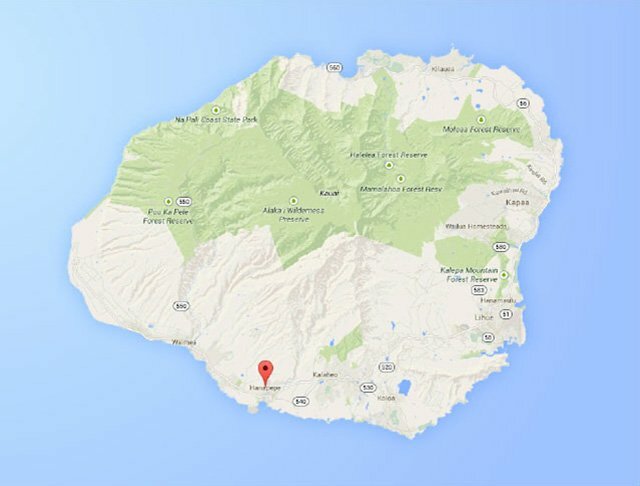 When she got to Kauai – which, in the early 1970s, was still undeveloped – she stayed, then met and married Frank Santos, a native Hawaiian. Santos went back to school for nursing, while Frank managed a restaurant. After their daughter was born, Santos didn’t want to work long hours as a nurse. Instead, she found an opportunity at Frank’s restaurant. 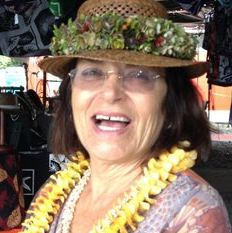 She gave the restaurant a proposal to take care of its interior plants – securing the first client for her small plant rental company that launched in 1977 as No Ka Oi Plants. Once she got in the door for interior plants, clients started asking her to maintain landscapes. As customers built new properties, they asked for help with landscaping, so the couple earned their contractor’s licenses and added landscape installation and maintenance services. No Ka Oi was growing when suddenly, in November 1982, Hurricane Iwa ripped past Kauai, setting records by inflicting hundreds of millions of dollars in damage. At that time, the company had about five employees and was mainly doing plant rental work. While Santos doesn’t recall too many of the details from the 1982 hurricane, she says a few small customers survived, keeping No Ka Oi afloat while they slowly rebuilt the business. 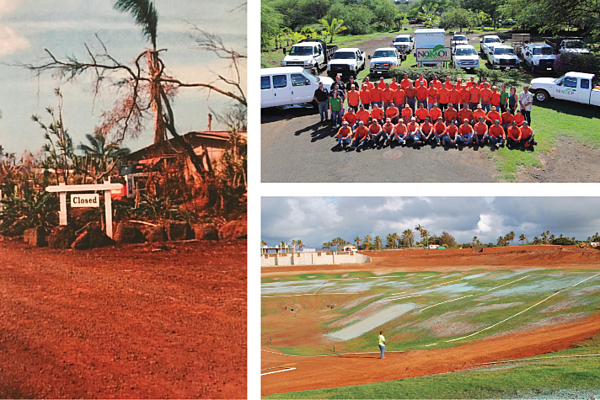 After the hurricane, development on the island accelerated through the ’80s, bringing more landscaping work. Unfortunately, that meant the business and its customer base were bigger when Hurricane Iniki struck in September 1992. With winds exceeding 140 m.p.h., the Category 4 hurricane caused nearly $2 billion in damage to Kauai – the most destructive Hawaiian storm on record. Most of the company’s work was on the south side of the island, and that was where the hurricane did the most damage. Santos says the company lost 90 percent of its income and the company’s nursery was destroyed on top of damage to the office and their house. At that point, the company’s business was split 50/50 between plant rental and landscaping. It was during that time that Santos realized that massive damage required massive clean-up, and shifted her focus from interior plants to landscaping. Santos applied for and received a small business loan to help keep the company running. As customers along the shore recovered, Santos bolstered the business with clients further inland. “If you’re on your toes, you can get a lot of work after a storm,” she says. One example of Santos’ ambition was the pursuit of the Sheraton Hotel. Before the hurricane, the hotel only used No Ka Oi for plant rental. But the hotel was wiped out from the storm, taking a year to rebuild and reopening without a landscaping company to work on the grounds. No Ka Oi only had one competitor, who was so big that they weren’t paying as much attention to the Sheraton as Santos. Six months after the hurricane, No Ka Oi locked down the maintenance work for the Sheraton’s garden wing. Six months later, they got the rest of the facility. The Sheraton is still a customer today. The Sheraton gave her credibility with other resorts and high-end clients. 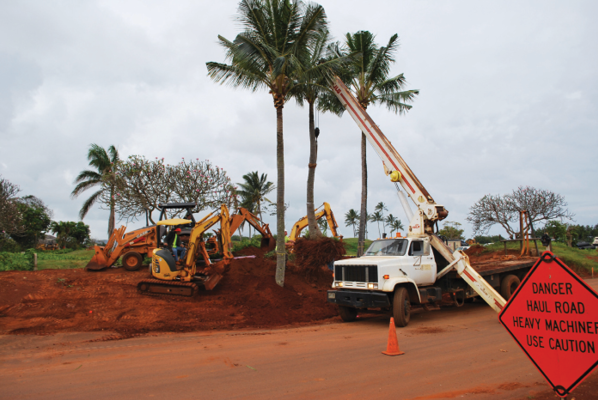 Santos sold the plant rental business to focus on grounds maintenance, and Frank took charge of landscape installation as No Ka Oi Landscape Services grew. 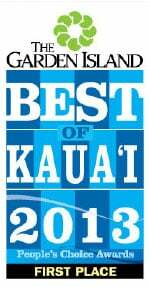 Today, No Ka Oi’s business is 80 percent commercial maintenance. 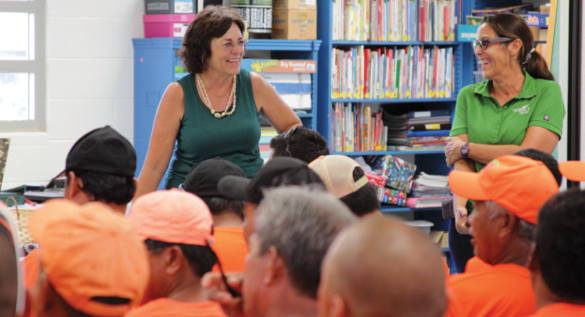 As maintenance work increased, Santos focused on growing the business through delegation – for example, hiring a horticulturist with the maintenance experience to train her staff. Employees continue to teach each other so she can focus on growth. No Ka Oi’s crews are composed of a leader and Gardeners 1, 2 and 3, so higher-level gardeners train newer employees. While Gardener 2 runs the trimmer or the mower, Gardener 1 observes while following behind with a blower. Then, Gardener 3 teaches Gardener 2 how to identify pests or spray weeds. Weekly safety meetings take place online, making training easy. Santos used to print 60 copies of safety notes every week, then visit jobsites to collect employees’ signatures. Now, foremen use a smartphone app that provides safety topics and tracks attendance at weekly meetings. “If there’s an accident, they add details and photos to the app,” Santos says. Foremen also use apps to track their team’s hours, so payroll and billing are streamlined online. And while it’s safe to say Santos doesn’t want another hurricane, the one in 1992 helped the company get where it is today.